Nothing can bad can happen to your iPad down there on a stage floor. Nothing. Electric guitar players have effects pedals. It’s an addiction, and a law of nature. We keep buying little stomp boxes in pursuit of the perfect sound, and of course we don’t even call it sound. We call it “tone.” But the sensible players don’t try to beat the addiction. They switch to software. Instead of buying and trading expensive hardware boxes, they move to something like iOS effects apps, which let you experiment at a fraction of the cost. 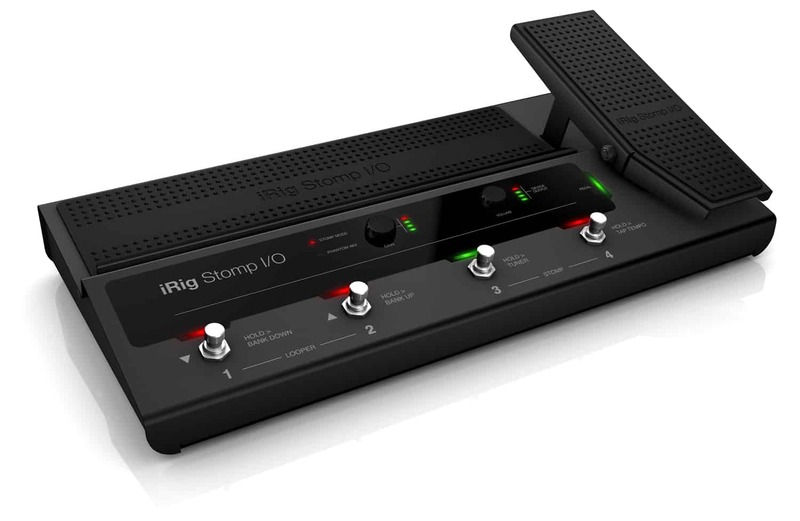 And that’s where IK Multimedia’s new iRig Stomp I/O Pedalboard comes in. 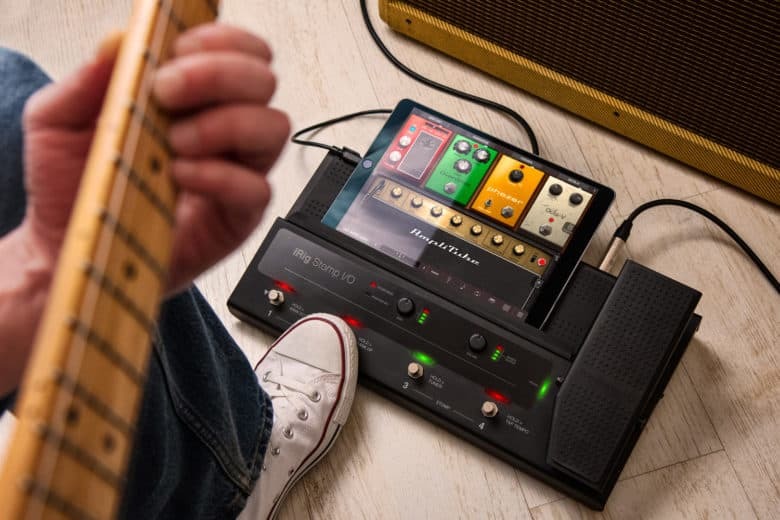 It’s a hardware pedalboard that provides guitar players with a familiar front-end to all those amazing iOS effects. The Stomp I/O looks pretty great. It has four foot switches, plus an expression pedal, which is kind of like a control knob for feet, the same kind of treadle that controls a wah-wah pedal, only this one can control any kind of effect of sound parameter. The only other controls are gain and volume knobs, for controlling sound levels as they enter and leave the unit. The idea is that you plug your guitar into the Stomp I/O, then plug the output into a guitar amp. then, you How to plug your guitar into your iPhone and rock out | Cult …, and the Stomp I/O sends the raw guitar signal to your software, and the effected signal is sent back. The foot-switches and pedal let you control the software from the floor, leaving your hands free for playing. The physical connections are all around the back. There are ports for iOS (using a special cable) and for Mac (USB), as well as a headphone output, MIDI in/out ports, and stereo line out jacks. You can also plug in a microphone instead of a guitar, and there is Phantom Power to power mics that need it. Finally, you can plug in yet more footswitches. Those stress outputs mean that you can hook the Stomp I/O up to a pair of powered monitor speakers instead of a guitar amp, and you can also use this on stage, sending the signal direct to the house PA system. It’s very well thought out, like most IK Multimedia products, and has some clever extras. For instance, even without a Mac or iPad plugged in, the Stomp I/O can still control other MIDI devices by itself. How much for this box of wonders? $300, which in the world of guitar-pedal related gear is a bargain. Just think of the money (not to mention the closet space) you’ll save by not buying tons of new pedals every month. Also, it’s mostly metal, which means it should last longer than all those flavor-of-the-month boutique stompboxes.